Edwin (b. 1823), Abram (b.1827) and Charles Elfelt (b.1828) were born in Millerstown, Pennsylvania. 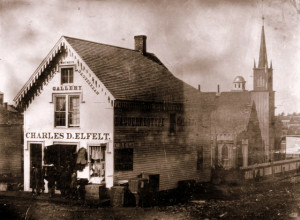 In 1849, Charles Elfelt moved to St. Paul, Minnesota. With a small amount of money, he established a dry goods store. In 1850, his older brothers, Edwin and Abram, joined him in the business, which was located on Eagle Street, near the Upper Levee. An amateur actor, Charles Elfelt performed in local theater productions. 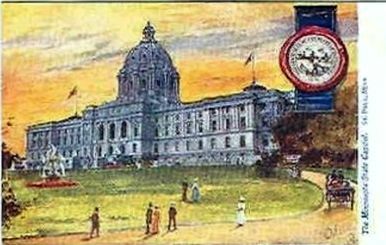 He invested in the building of the first theater in St. Paul at Third and Exchange Streets. Abram Elfelt organized the Board of Trade in St. Paul. Eventually, this organization became the Chamber of Commerce, and Abram Elfelt served on its first Board of Directors. Abram was also a member of the Minnesota Historical Society. Although the Elfelt Brothers were not “synagogue-going” Jews, Abram helped found B’nai B’rith Lodge #157, which still functions today. In 1871, Abram served as its President. He was the Chair in 1872 and attended the Convention of the Grand Lodge in 1874. Abram Elfelt married Sue Fryer. Abram Elfelt died in 1888 in Minnesota. Charles Elfelt died in 1899 in Minnesota. Edwin Elfelt died in 1891 in San Francisco, California. W. Gunther Plaut, The Jews in Minnesota: The First Seventy-Five Years (New York: American Jewish Historical Society, 1959). Samantha Silver is curator for this Elfelt Brothers exhibit.